For seven years Westie has been hunting the cannibals that killed her family and took her arm. Each time she goes out in the wild, she hopes to be able to find closure on events that still haunt her. At the beginning of Revenge, Westie is just returning to Rogue City from another unsuccessful outing. Besides humans, Rogue City is an amalgam of every type of creature you can think of. Protected from outside threats under a dome of Native American magic, it can be just as dangerous within from its denizens. But it’s where Westie’s adoptive father Nigel has made his home since he took her in and gave her a mechanical arm, and Rogue City suits Westie just fine. That is, until the horrors from her past show up on her doorstep. Without proof, and with a past of unreliability, no one believes Westie when she claims danger. So, with help from those who care about her, she’s on a mission to reform, and get the revenge she so sweetly desires. From the very first page of Revenge and the Wild the setting just jumped out at me and pulled me in. 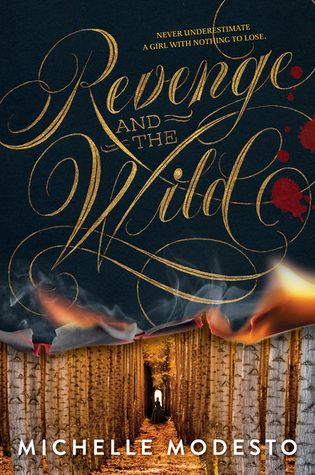 A steampunk Wild West mixed with the supernatural as well as Native magic was great. Although, I will admit, what I felt like was supernatural creature name-dropping was a bit much. I counted at least six creatures mentioned just within Westie’s arrival back in the city. That’s not counting the rest mentioned throughout the remainder of the book. While I think it’s awesome that Michelle Modesto was trying to add a lot of depth to this interesting world, it doesn’t really pan out due to the fact that this is (as far as I am aware at this moment) a standalone book. Meaning, there’s not enough time to really delve into what all these creatures bring to the table in this world. Are they nice? Dangerous? We kind of get a generic summation of all creatures which seems like a cop out as opposed to enriching. This is pretty much my biggest complaint with the book. It would work so much better as a series, or even if Michelle Modesto writes more in this world with different characters. But at this point we don’t know that, so just judging this standalone, there simply wasn’t enough time to develop everything that is started. This is seen big time in Westie’s string of admirers. This is a story where it seems every male is attracted to Westie. She’s a pretty awesome heroine; honestly, she’s very brash and ready to jump into the fray. She may not always make the best decisions, but she’ll stand behind them and try to fix whatever went wrong afterwards. But with so many guys throwing their hat in the ring for Westie’s attention, the real relationship doesn’t feel like it’s been done justice by the end. I would have much preferred more focus put on what ended up mattering because it had all the elements I love in my romances. Regardless, Revenge was a no-holds-barred read. The imagery was beautiful. If not for the terrifying cannibals, it would be an awesome fantasy place to visit. Even with what I found a problem in this book, I sincerely hope Michelle Modesto expands this world with more stories.